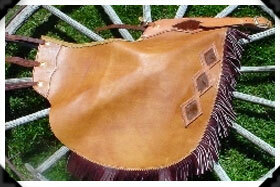 Only the finest leather is used in our chaps and chinks. We make three basic styles. Shotguns are full length, chinks come just past the knees, and batwings are flared at the bottom. 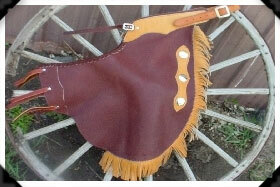 All chaps come with choice of laced or buckle on the back belt. Yokes can be either chap or tooling leather. 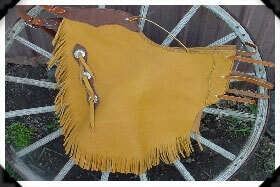 Tooling leather can be plain, border stamped, basket stamped, or floral carved to meet your needs. For proper fit please see our fitting guide. Shotguns come with choice of zipper, adjustable snaps, or buckles on the legs. Chinks come with choice of adjustable snaps or buckle legs. Batwings come with choice of adjustable snaps or buckle legs. 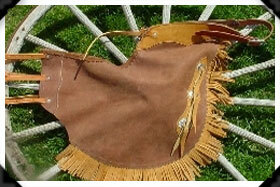 Cream colored with double fringe 3" and 6" and basket stamped yoke and shield and fancy conchos. 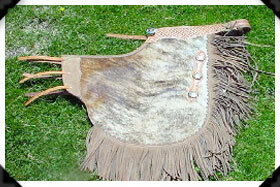 This pair is dark brown with buckskin yoke shield and fringe. 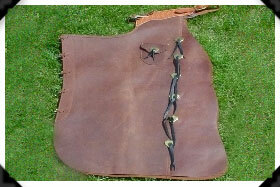 This pair of batwings has a basket stamped yoke and heart conchos down the legs.